Detects micro leaks in modified atmospheric packages. PRYDE Measurement has released the PBI Dansensor LeakPointer, a tabletop system that detects micro leaks in modified atmospheric packages containing CO2. It is a nondestructive test system that uses CO2 as trace gas for a leak trace. The analyser creates a user-defined vacuum in the test chamber. In the event of a leak some of the gas in the package will leak out into the chamber. An increase in the CO2 level in the test measuring chamber indicates that there is a leak in the package and an alarm will be activated. 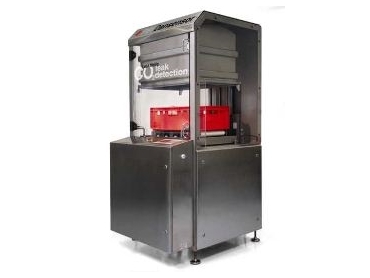 The micro leak test can be performed on many types of products, including meat, seafood, poultry, pasta, bread and cheese, in flexible or nonflexible packages such as milk powder cans. A monitor module is placed on a front panel for easy operation. This gives access to setup menus via a touch screen display. The monitor module has a graphical LCD touch screen with backlight. All test data is gathered for quality control and it is possible to print out test statistics with time and date or to transfer data to a PC. When starting up the system performs a self test and in case of an error in the system an error message will appear in the display in the language chosen during setup.